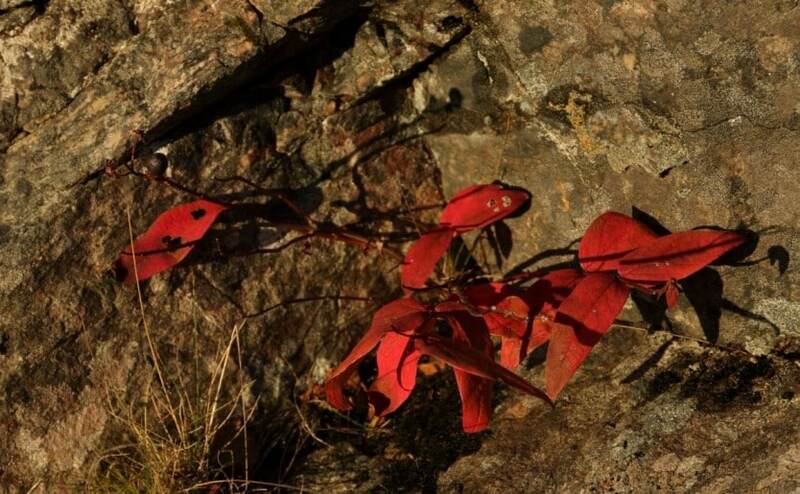 These striking, deep red, autumn leaves were spotted and photographed by David Haines near Lagg (NC0831) on 15th December. They had me puzzled for quite a while, but a really close look at his picture has now solved the mystery. The clues are as follows. The plant is a tough herbaceous perennial, growing out of a crevice in a roadside rock outcrop. Its leaves are slim, paired, stalkless, with smooth margins and slightly rounded tips, and lateral nerves that link up along the edges. The real clincher is a single fruit on the left of the picture. It is the one remaining member of a small cluster of stalked, black, berries, bearing the remains of sepals around their bases. The plant looks a bit like honeysuckle, but the habitat and form is not quite right and that species bears its sepal remnants on the top of stalkless fruits. The answer is tutsan Hypericum androsaemum, a shrubby member of the St John’s-worts, of which only one other species occurs locally, Hypericum pulchrum , slender St John’s-wort. Tutsan is thinly scattered across Assynt, nearly always near human habitation or in areas disturbed by human activity. It is a native species elsewhere in Britain and Ireland, but around here may be a relic of or escape from cultivation. Nevertheless it is always worth noting, and this appears to be the first record for the hectad (10 km square) NC03.